Without a doubt, the most important event of 2010 was the passage of the Affordable Care Act, signed into law by President Barack Obama on March 23. Thanks to the portions of the new law already in effect, young adults can remain on their parents' plans; uninsured people with preexisting conditions can get insurance; and seniors were able to receive rebate checks. By 2014, the landmark law aims to extend coverage to 32 million Americans by requiring individuals to have insurance and by expanding Medicaid and employer-based health coverage. Insurance reforms include ending lifetime limits -- and most annual limits -- on care, and giving patients access to recommended preventive services without cost-sharing. Overall, the law is expected to save more than $100 billion over the next 10 years and more than $1 trillion in the next 20 years. But the controversial measure still faces challenges. On Dec. 13, a Virginia judge said the law's insurance mandate in the bill violated the Constitution. Twenty more states filed a lawsuit together, also arguing that the act is unconstitutional. A judge in Florida has begun hearing the case. In late April, Johnson & Johnson (JNJ), the world's biggest maker of health care products, recalled more than 135 million bottles of over 40 different over-the-counter medicines, and it has been plagued with many other quality-control problems and recalls since then. Those recalls prompted two Senate investigations and congressional action. They also highlight that the industry faces a wider drug-safety problem, as a perusal of the Food and Drug Administration's drug safety page further underscores. Just this month, Pfizer issued its fourth Lipitor recall of 2010, while Abbott recalled 359 million diabetes test strips. Food recalls also seemed to be on the rise this year, with a large and urgent nationwide eggs recall, as well of a recall of cheese and frozen desserts. One in six Americans gets sick from food-borne illness each year, according to the Centers for Disease Control and Prevention. These recalls paved the way for the biggest U.S. food-safety overhaul in more than 70 years, the Food Safety Modernization Act, which Congress passed in December. Under the law, the FDA will gain more power to police domestic and international food companies, including the power to mandate a recall if a company refuses to issue a voluntary one. 2010 saw several big breakthroughs in the fight against HIV, the virus that causes AIDS. After an experimental vaccine demonstrated some effectiveness in preventing HIV in a trial in Thailand last year, some studies this year found evidence that antiretrovirals, or HIV treatments, also can prevent infection. A new study in South Africa showed that a vaginal gel made using Gilead Sciences's (GILD) AIDS drug, Viread, cut HIV infections by 39% in women. Another study showed that men taking Gilead's pill Truvada daily reduced their risk of catching HIV by 44%. Sponsored by the U.S. government, the two studies' conclusion that AIDS treatments also can prevent HIV ranked as the top medical breakthrough by Time magazine and also was voted one of the year's top 10 breakthroughs by Science magazine. U.S. government scientists also discovered two potent human antibodies that can stop more than 90% of known global HIV strains from infecting human cells, which could potentially help create a vaccine. Throughout the year, health officials stressed that obesity is a major public-health issue, related to a large number of medical conditions and costing the U.S. as much as $147 billion annually in health care. Despite all this attention, Americans keep getting fatter, which is why three drugmakers were racing to become the first in years to bring new diet drugs to the market. By year-end, only Orexigen Therapeutics's (OREX) Contrave had received a thumbs up from an FDA advisory committee. The FDA rejected Arena's (ARNA) lorcaserin and Vivus's (VVUS) Qnexa. Unemployment has remained a top economic concern this year, and the pharmaceutical industry bore more than its share of the pain. By the end of November, the industry topped all other categories -- except for the government -- in U.S. layoffs. According to Challenger, Gray & Christmas, the pharmaceutical industry lost 50,168 jobs, slightly more than 10% of the country's nearly 500,000 layoffs. In addition, the health care-products sector lost 26,612 jobs in the first 11 months of the year. AstraZeneca (AZN) topped the list with 8,550 layoffs, according to FiercePharma, followed by Pfizer, GlaxoSmithKline, Roche, Bayer, Abbott Labs, Sanofi-Aventis and more. Unlike 2009, which saw giant takeovers, such as Pfizer (PFE) buying Wyeth, Merck (MRK) buying Schering-Plough and Roche (RHHBY) buying Genentech, the 2010 deals were much smaller. Among the biggest: Novartis (NVS) finally sealed its majority-stake buyout of Alcon (ACL) for $12.9 billion in the largest deal of the year; Astellas bought OSI Universal for $4 billion; Pfizer bought King for $3.6 billion; and J&J acquired Crucell for $2.4 billion. The biggest deal that never happened? Sanofi-Aventis's (SNY) hostile takeover of Genzyme (GENZ). Sanofi made an unsuccessful bid of $18.5 billion in October, and its courtship will likely continue well into 2011. Big (and Not-So-Big) Pharma settled one case after another this year, fighting governments and patients in the courts. 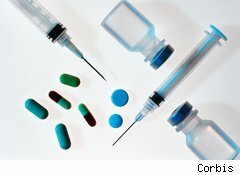 A study by Health Research Group at Public Citizen, which looked at payments made for violations of the False Claims Act, found that pharmaceutical companies have become the biggest defrauders of the federal government, surpassing the defense industry and growing at an "alarming rate." The off-label promotion of drugs -- when a company markets the medicine for an unapproved use -- was the single largest category for financial penalties. Purposely overcharging for drugs under various federal programs was another. According to findings from Taxpayers Against Fraud published in October, Allergan (AGN) topped the list with $600 million in payouts, followed by AstraZeneca with $520 million and Novartis with $422.5 million. Since President Obama appointed Margaret Hamburg as the head of the FDA, the regulatory authority has become stricter in both its approval process and enforcement. The FDA started revamping its medical-device regulations, and a Government Accountability Office report also found that the "agency has become more conservative" in allowing some evidence from certain drug trials. The agency also flexed its muscles when it came to drug marketing and drug safety. The FDA's tougher approach has mostly been welcome, especially its decisions to pull Abbott's (ABT) diet drug Meridia from the market and to restrict access to GlaxoSmithKline's (GSK) diabetes drug Avandia. But critics have argued that some of its recent actions could hurt consumers. The FDA's decision to remove the breast cancer indication from Roche's drug Avastin, for example, was controversial. The courts made at least two decisions in 2010 that have far-reaching consequences for scientific and medical research and funding. The first involves embryonic stem-cell research. After Obama lifted a ban on funding human embryonic stem-cell research in 2009, a court in August blocked the funding. The injunction was lifted in September, but the issue is likely to remain under court review for some time. Nevertheless, Geron (GERN) enrolled the first patient in its embryonic-stem-cell drug for spinal injury. The FDA recently approved another trial for Advanced Cell Technology's (ACTC) stem-cell drug for blindness, and a stem-cell clinical trial for stroke patients began in the U.K. in November. Another big issue was that of gene patentability. In October, the U.S. Department of Justice reversed its stance on the longstanding practice of patenting genes with its opinion that genes should not be patentable. Gene research has made many breakthroughs this year that could result in important new medical treatments for diseases such as cancer. Many health care stories made headlines this year, and not all of the important stories made it into this top 10 list. Not on the list but deserving special mention is the passage of the James Zadroga 9/11 Health and Compensation Act of 2010, which aims to provide health care to the first responders of the Sept. 11, 2001 terrorist attacks who continue to struggle with various medical conditions as a result of their heroic efforts to help others in the aftermath.